After the front cover is removed, you can get a look at some of the camera’s internal workings. The shutter mechanism is built around the taking lens, and the controls to adjust the Aperture and Shutter speed are accessible. Adjacent to the viewing lens is a small mechanism that controls the self-timer. The goal is to adjust the viewing lens so that it matches with the taking lens. To do so, use a spanner wrench or a set of calipers to loosen the locking collar below the viewing lens. Once the collar has been loosened, you should be able to turn the taking lens with your fingers. If needed you can completely unscrew the viewing lens and remove it to clean the elements, but this is not necessary for adjusting focus. Set up the camera for checking focus as described in the previous post. To keep the shutter open with the front cover removed I wedged a small piece of cardboard into the shutter release opening to hold open the shutter. Using a magnifying glass move the camera back and forth until the taking lens is perfectly focused. Without moving the camera turn the viewing lens until the image in the viewfinder is also focused correctly. This can be quite fiddley, and I had to turn the viewing lens in and out a few times to find the proper position. Double check that both of the lenses are properly focused. Without turning the viewing lens, tighten the collar against it so it can no longer turn freely. The viewing lens and taking lens should now be properly aligned. Compare the two at different focus distances and see if they consistently agree. Don’t worry If the stated distance on the focusing knob is not accurate, that can be easily adjusted later. 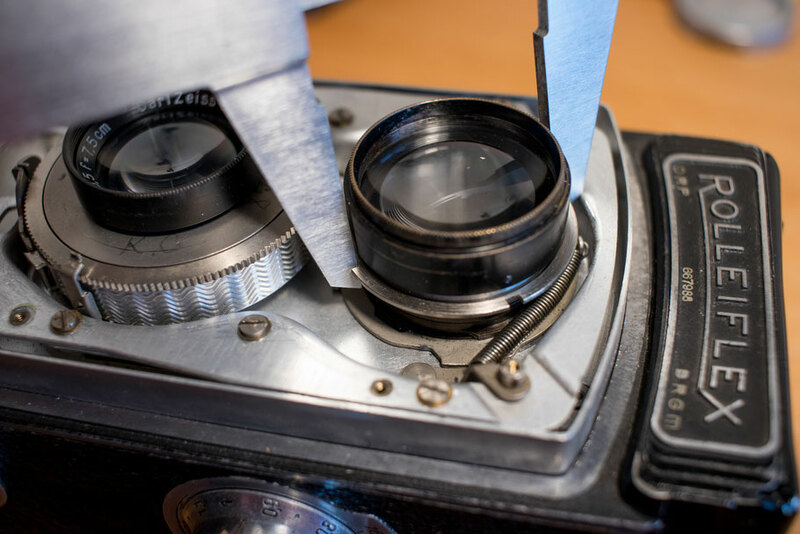 If the taking lens and viewing lens do not correspond at all focusing distances, then the whole lens board may be out of alignment or there is another problem. In my case, once the two lenses were aligned, they corresponded regardless of focusing distance. Once you are satisfied that the focus is as it should be, putting everything back together is fairly straight forward. Here are a couple things to watch out for. Remember to put the pin back in the shutter button, and screw in the flash sync cable. Check that the washers between the faceplate and the camera are properly aligned. When tightening the 4 main screws, be sure that you can easily adjust the camera settings with the wheals on the faceplate. The first time I tightened them too much and could hardly move the dials. I ended up adding some additional thin washers to give the gears a it more space. 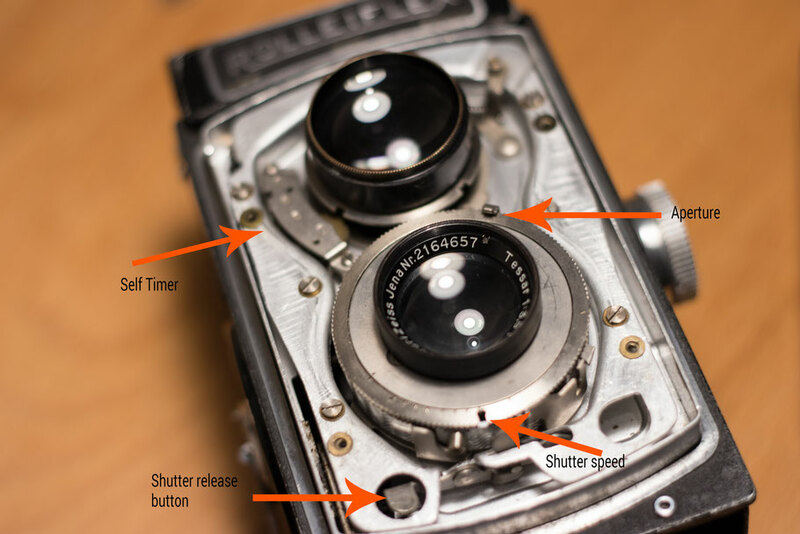 To do this you will need to loosen the focusing knob and rotate it to line up correctly with the distance marks on the camera body. 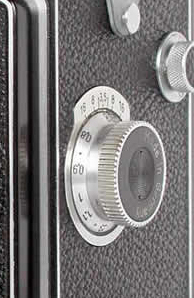 Depending on the year of the camera, the focusing knob may have a round leather piece covering it, or a machined cap with two small holes. If it is leather, you will need to carefully peal it up to reveal the holes. I used a set of dividers inserted in the holes as a wrench to unscrew the cap. Under the cap is a single nut holding the knob to the focusing shaft that extends into the camera. Loosen the nut, and rotate the knob so that it indicates the proper distance. When satisfied, tighten the nut and reattach the cap. I punched two small holes in the leather covering on my cap so that I can access it again if needed. The camera should now be focusing properly, and the distance indicator should be accurate. Go out and take some pictures to be sure!